Be the first to share your favorite memory, photo or story of Augusta. This memorial page is dedicated for family, friends and future generations to celebrate the life of their loved one. 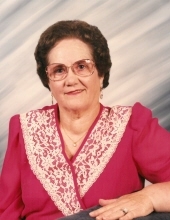 Augusta (Gussie) Lawless Smith of Martinsville passed on to her promised heavenly mansion on Thursday, October 17, 2018, at SOVAH Martinsville after a decline in health for the past few months. She was the last member of her generation. Mrs. Smith was born in Stokes County, NC on August 3, 1922, daughter of the late Joe Henry Lawless and Mattie Lee Hall Lawless. On October 23, 1940, she married the Late Charlie Woodrow Smith of Mayodan, NC. She spent all of her adult life in the Martinsville-Henry County area. She worked as a seamstress for Bassett Walker Knitting from where she retired after 43 years of service. She was a charter member of Stone Memorial Christian Church, Collinsville, Va.
She is survived by her Nieces, Pat Swafford (Terry), Louise Covington, Faye Witt, and nephews Bill Shelton (Bonny), Mike Lawless and Tommy Lawless (Diane). She is also survived by special great nieces Cynthia Riley (Joe), Kathy Lawless, Sherry Gammon (Ronnie) and Carolyn Joyce and great nephews, Phillip Lawless and Jimmy Lawless (Cynthia) as well as many other beloved great nieces and nephews. In addition to her parents and husband she was preceded in death by five brothers, Moir, Clarence, Roy, Fletcher and Nathan Lawless and one sister, Rilla Lawless Shelton. Visitation will be held at 1 p.m. on Sunday, October 21, 2018 at Stone Memorial Christian Church with a funeral service to follow at 2 p.m. with Minister Tim Wood and Minister Lawrence Harris officiating. Interment will follow in the Joyce Family Cemetery, 1658 Beasley School Road, Sandy Ridge, NC. 27046. The family expresses thanks to Pat Swafford who was primary caretaker and personal assistant to Aunt Gussie for many years, to Glenna Young who gave her time to take Gussie to buy groceries and any errands that were needed and to Debbie Young, her hairdresser who went the extra mile to meet her at the car and assist her into and out of her beauty shop on her weekly visits. And to any others that has shown love and care for her. Norris Funeral Services, Inc. and Crematory Martinsville, VA is serving the Smith family. To send flowers or a remembrance gift to the family of Augusta Lawless Smith, please visit our Tribute Store. "Email Address" would like to share the life celebration of Augusta Lawless Smith. Click on the "link" to go to share a favorite memory or leave a condolence message for the family.